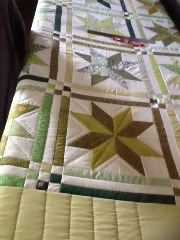 I am staying busy with quilts...even though there is lots to do outside these days. 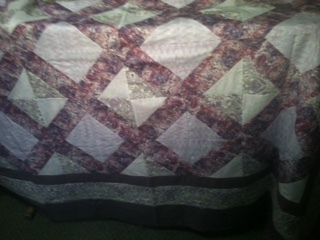 Right now, I have this one in being hand quilted. This is the LaMoyne Star...a custom order. I am right in the middle of the quilt now. I just put this little baby quilt on the Coronet, but haven't taken a stitch yet. 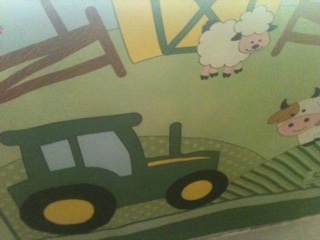 It is a John Deere!!!!! I couldn't stand back far enough for a full picture, but you get the idea....right? I have this order all pieced and waiting to be hand quilted. This is called Floral Arber, and is done in soft colours for a little girl. I have one more to piece for this lady. 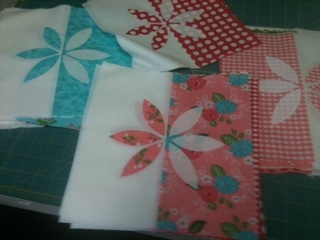 I am also working on a little applique too....a quilt by Missouri Star called Wallflower. There are 42 blocks here....I think I have about 8 finished....lol. I think it will be very pretty!!! Well...back to quilting for a bit before bedtime. Have a wonderful week, folks!! Lots of projects on the go! I love the Missouri flowers. So dainty! I've seen the flower quilt done and it is really pretty. I know we say every year where did summer go , but it's so true, and I swear it seems to go faster. It did seem like the garden was just getting started and noe it's so lush. You always have so much going on - both inside and outside. That John Deere quilt will be so sweet and I can't wait to see that flower one together. So many projects! I haven't done any hand quilting in a long while but am itching to hand quilt.